Last year while visiting Cornwall with my mother we had the fortune of staying at Lanyon, a perfect countryside hideaway comprising three cottages surrounded by fields and farmland (and also home to my good friend, Marie Leggo). The farmland is owned by the Leggos but leased to local farmers, and one of those farmers had chosen to fill his ample acreage with rows and rows of cauliflower. It just so happened that when Mom and I arrived at Lanyon last year, it was just after the cauliflower harvest, and Marie took us out to the fields to glean any cauliflower that was left behind. 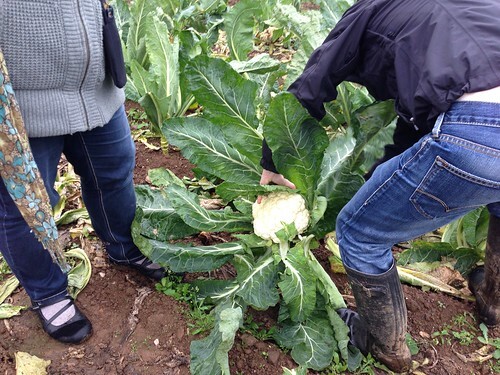 The cauliflower gleaning was hugely exciting to Mom and I – not only are we both fascinated by “gleaning” (we bonded over the film The Gleaners and I, but we are also both cauliflower fanatics). 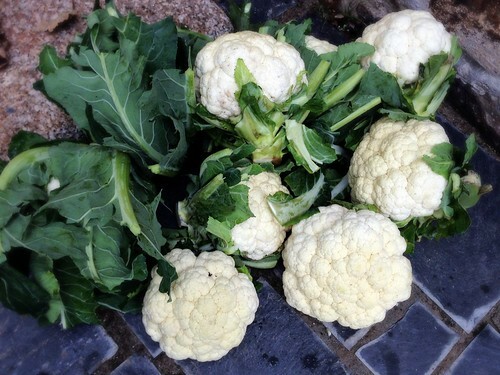 And when we saw the bounty of cauliflower that remained in the field, we were over the moon in cauliflower bliss, but also shocked by how much perfectly good cauliflower gets left behind. We took as much as we could, resorting to some clever means to do so, but still, there was way more cauliflower than we could ever carry or consume. As we walked back to the house, arms laden, we bantered about all of the possibilities and started scheming more creative uses for cauliflower. One of the things I’ve been toying with a lot lately is using cauliflower as a grain substitute. If you put cauliflower in a food processor and chop it super finely, cauliflower takes on the size and shape of grains and looks much like rice, couscous or bulgar wheat. And you can use it in similar ways, for example, cauliflower fried “rice” or cauliflower “couscous”. On that particular day at Lanyon I attempted a cauliflower “rice” pudding which was probably pushing the whole concept a little too far. However, stick with the savoury options and cauliflower grains, be they raw or cooked, are a pretty safe bet. 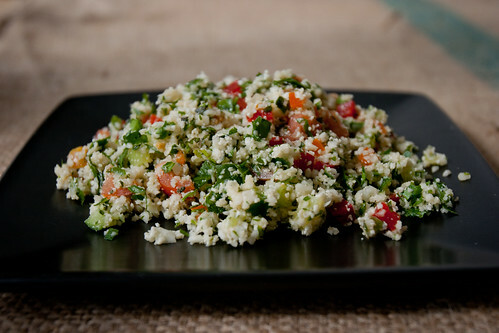 My favourite cauilflower-as-grain option is this cauliflower tabbouleh which is inherently raw, vegan and gluten-free. 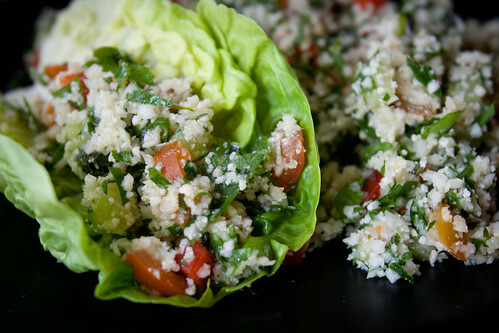 I like to serve this with falafel and hummus, or wrapped up in little gem lettuce leaves. You can adapt it as you see fit – add some roast or grilled veggies, sprinkle with pomegranate seeds, mix in some chickpeas or add a drizzle of tahini sauce. And while it’s most satisfying when made with reject cauliflower you’ve gleaned yourself from a farm, it’s just as good with store-bought cauliflower which is one of the most readily available, nutritious and frugal vegetables out there. Put the cauliflower florets into a food processor and blitz it until it reaches a couscous-like texture. Combine cauliflower with the rest of the ingredients. Season well, adding more lemon, salt and pepper to taste. EXTRA VEG ALERT: I am sending this recipe to Helen at Fuss Free Flavours for the Extra Veg challenge that she hosts with Michelle from Utterly Scrummy. This recipe also appears on Great British Chefs. Whoa, that’s a lot of leftover cauliflower in the fields! So cool that you could just go in there and glean. I feel like that’s maybe an idea that doesn’t translate in America? Or maybe it’s just an idea that hasn’t taken off yet – perhaps it needs someone like you to start a new trend. 🙂 You HAVE to watch “The Gleaners & I”! OMG! How much are we on the same wavelength!? I posted a ‘loaded’ cauliflower couscous salad with turmeric chickpeas recipe the on April 1, with option for raw. Wow. It sounds like you are having a right love-in with this fabby veg. 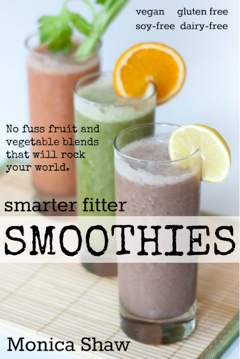 Me too.Love the simplicity of this and will have to try it soon, Monica. Your loaded cauliflower couscous is truly inspired. The turmeric! The chunky veg! I want it all! 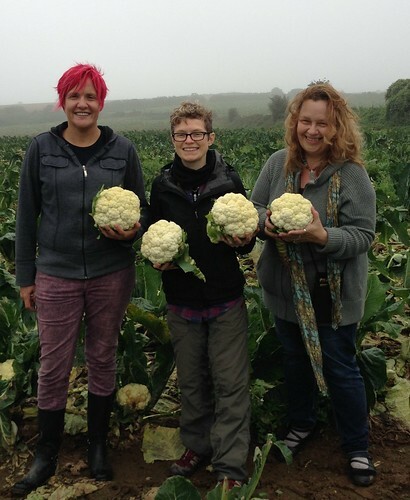 Hurray for mutual cauliflower creativity and inspiration! Love-in is right. I want to go and buy a cauliflower right now and make this Monica!